Each of our houses has a sauna, spabath, log fire, all bath rooms are en suite, and are decorated in a manner that they blend in with their surroundings, providing a true ' Home ' away from home. One can book for one day of a month. We welcome up to two pets per house. All the houses have tiled floors, with underfloor heating, leather furniture. Six houses have bed rooms on the ground floor for the less able guests, 4 with walking shower. Each cottage has its own paking place. The houses have gourmet kitchen to make your best Highland dinner. Children of all ages are welcome, we can supply a baby cot, highchair. and a few toys. and the famous Oban whisky distilley, museums and fabulous restaurants. Also well stocked supermarkets. Who will also deliver to Melfort Pier. If you do not want to cook? NO, problem , we have a great restaurant, with in a 10 min. walk . Need to get away from it all ??? This is the place to unwind and rejuvinate. Give " Melfort Pier & Harbour " a change and you will be happy you did. 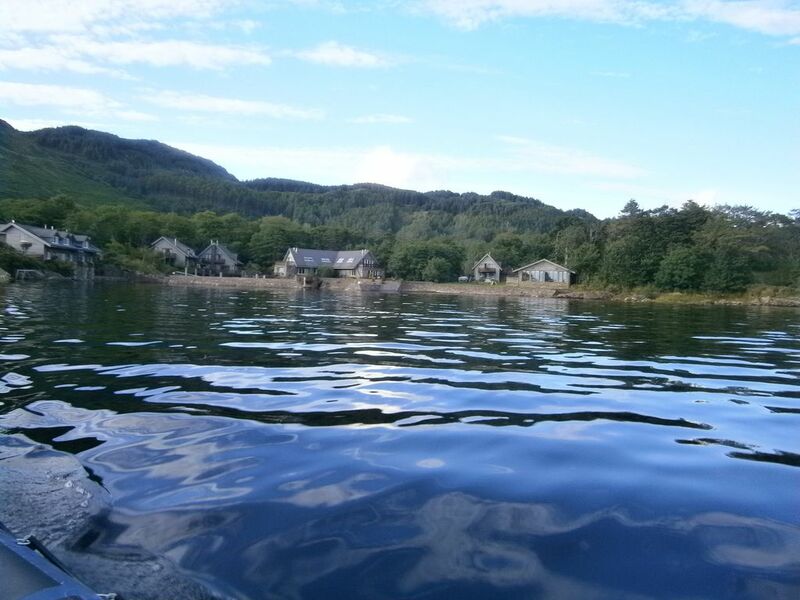 Great properties, fabulous views, in a secluded waterfront setting. Just back from a two night stay at Melfort Pier and harbour lodges. The location , views , peace and tranquility of staying at this property have left us totally relaxed and refreshed. We took our two dogs and the walks surrounding the property are excellent. We stayed in the ‘anchorage’ property, a two bed , very spacious lodge, which was very well equipped. It had amazing views over the water from the open plan kitchen / lounge areas. It also had a patio area and terrace around the front of the property which looked onto the pier and harbour. And a special mention for Mary the on site representative. She was a gem and made us feel very very welcome. You may wonder why not five stars? Well the location is truly wonderful and fully deserves five stars . The lodges are fully equipped as mentioned, but the decor and furnishings, bed linen etc in the lodge could be refreshed. So 4 stars overall. Would we go back.. absolutely and we’re already thinking about our next visit. Dear Stuart, Thank you so very much for taking your time to write such a good review. We agree with every thing you say but ……. We clean every thing with a very strong disinfected so very thing is fresh for the next guests. It discolours the linen in a few washes. We had a very busy summer and in the winter all the houses get painted and refresh. But like you our guests like to feel relaxed in the houses, and do not feel like they are sitting in Grandma's palor. You were one of our cleanest guests...and with clean little dogs. If all our guests were like you ….we can make Melfort a more posh place. Thank you again for your review, and we are looking forward to welcome you all 4 back again to Melfort Pier . We really enjoyed our stay. Place was clean, comfortable, and we even had our own personal sauna in the apartment. Absolutely beautiful. Loved our short visit to Melfort Pier. The home is beautiful, clean and well stocked. Stunning view. The home is lovely with a stunning view. The home was clean and well stocked.We loved the surrounding area and recreation available. we had a perfect time at melfort pier & harbour. cosy appartment with all the luxury one can imagine. L'hébergement Dock Master est spacieux, clair, avec une vue unique sur le loch et les quais privés. L'équipement mis à disposition est parfait. Logement très propre. Tout est conforme aux informations du site. Nous n'avons pas eu l'occasion de rencontrer les gérants, mais la confiance partagée est méritée. Nous recommanderons, dans cette région, cette adresse pour un vacancier voyageant avec un bateau personnel. Une déception : Nous avons visité l'ile de Seil : jolis paysages, mais l'accueil du restaurant signalé au bout de l'Ile ( "Oyster ..." ) ne mérite pas le déplacement. You can do as little or as much as you want to do ....just bring a book and relax on your balcony , or bring you jets skies, diving bottles and explore that waters of the Atlantic Ocean. The Loch is refershing to swim in the clear water, of the ocean . Bring your dog(s) and your walking boots, and you can be busy for months walking our beautiful and peace ful hills. Bring your camara or painting brushes. Lots of wild life. Melfort Pier & Harbour is an Escape for all season. Oh, by the way...if you like to get married , we can arrange small weddings !